Many Bay Area housing markets remain heavily skewed in favor of sellers, as buyers contend with critically low inventory levels and plenty of competition. To be successful, buyers often must make quick decisions whether to move forward with an offer, but in some of the region’s hottest markets, they must make a move almost immediately. To find out where single-family homes sold the fastest in the second quarter, we dug into MLS data for each of the 70-plus Bay Area communities in which Pacific Union operates. While our intention was to compile a list of the 10 fastest-moving housing markets based on average days on the market, we have included 14 below to account for ties. Burlingame: Homes in the San Mateo County city sold in an average of 13 days in the second quarter. Over the past three years, Burlingame homes have never stayed on the market longer than 24 days. Albany: Buyers in Albany took an average of 14 days to close a deal, though the pace of sales dropped to as low as 11 days in the first quarter of 2016. Pleasant Hill: Homes in the Contra Costa County city also sold in 14 days, two days faster than in the first quarter. Los Altos: Los Altos homes left the market in 14 days, in line with the pace of sales recorded since the beginning of 2017. San Ramon: The final member of the two-week club, San Ramon homes sold in an average of 14 days, the fastest pace of sales recorded over the past three years. El Cerrito: Homes in El Cerrito sold in an average of 16 days, which while still fast is two days longer than the first quarter’s pace of sales. Piedmont: Piedmont buyers took 16 days to close a deal, and over the past three years, homes in the highly desirable Alameda County city have always sold in less than a month. San Mateo: Homes in San Mateo sold in 16 days, similar to numbers recorded since the first quarter of 2017. Alameda: Buyers on the island city scooped up homes in an average of 17 days, identical to the first quarter’s pace of sales. Menlo Park: In a separate analysis published earlier this month, we found that Menlo Park was one of the Bay Area’s fastest appreciating markets in the second quarter, and it’s also one of the quickest, with homes changing hands in 17 days. Moraga: Moraga homes sold in an average of 17 days, up from 12 days in the first quarter of 2018. Oakland: In the seven Oakland ZIP codes in which Pacific Union primarily does business, homes sold in an average of 17 days, the fastest clip in three years. The median sales price also reached a three-year high of $1.2 million. Palo Alto: Palo Alto‘s second-quarter median sales price of $3.3 million did not stop eager buyers, who took 17 days to close deals. San Francisco District 2: The city’s District 2, which includes the Sunset and Parkside neighborhoods, saw homes sell in 17 days, faster than they have in any other quarter over the past three years. The Bay Area’s decline in home sales (including single-family and condominiums) improved in July, with only 3 percent less activity year over year after a 13 percent decline in June. Compared with last summer (May through July), sales were slower in Santa Clara, Napa, Sonoma, Marin, and San Mateo counties. Sales activity declined by 19 percent in Marin County and by 13 percent in Santa Clara County. Sales of homes priced above $1 million — and especially those above $3 million — continued to fare better than they did last year. Only Marin County saw a decline in sales of homes priced between $2 million and $3 million, down by 7 percent year over year. Inventory finally improved, up by 2 percent, after 16 consecutive months of year-over-year declines. Most Bay Area counties saw inventory improve in July. Inventory above $1 million increased by 17 percent, mostly driven by more homes for sale in Santa Clara and San Mateo counties. In contrast, San Francisco still lost inventory across all price ranges in July, declining by 14 percent. Contra Costa County saw inventory drop by 5 percent from July 2017. Absorption rates continued to decline in Silicon Valley and Marin County, followed by Sonoma County. Fewer homes sold for more than asking price in Silicon Valley, Marin County, and Sonoma County. Overall Bay Area absorption rates for homes priced more than $3 million increased by 11 percent points, from 34 percent last July to 45 percent this July. The Bay Area’s median home price rose by 12 percent from July 2017. We expect median price growth to return to its recent five-year-average of less than 10 percent. After a notable drop in year-over-year Bay Area home sales, July’s annual decline improved again. Bay Area sales were 3 percent below last July, and year-to-date sales are only 1 percent below last year. Nevertheless, slower sales activity in Santa Clara and Marin counties that started earlier this summer persisted into July, with Marin sales falling by 19 percent from last July and Santa Clara activity down by 13 percent. On the other hand, Alameda and San Francisco counties continued with previously established trends, with annual increases in home sales activity. Table 1 illustrates the three-month change in sales by Bay Area county and price range, with red-shaded numbers suggesting declines and green-shaded numbers suggesting improvements. Overall, sales in the months of May, June, and July fared 4 percent below the same period last year. However, there were more sales of homes over $1 million than there were last year. Only Marin County saw slower sales activity for homes priced between $2 million and $3 million compared with the same three-month period last year. Sales of homes priced above $3 million saw the largest pickup in activity, particularly in Alameda and Contra Costa counties. Keep in mind that high-priced sales represent a relatively smaller share of overall activity in those areas, thus the actual number of sales is still rather small, about 30 sales over those three months in each county. By contrast, Santa Clara County had about 260 sales over $3 million during the same period. Sales of homes priced below $1 million continued to drop in all regions, especially in Silicon Valley, which registered an almost 50 percent decline. Importantly, the year-over-year declines in sales seen in many areas still put activity higher than it was in 2016. Figure 1 charts sales for May through July for the last four years. Most regions except Sonoma and Napa counties seem to have divergent trends. In Sonoma and Napa counties, sales have been continually declining. Santa Clara County has had the highest year-over-year variation, with sales dropping this year. While sales were slightly lower than last year in other regions, activity is still generally outperforming or matching sales from 2016. The year 2015 was the strongest for all regions, but there was more inventory then, and homes were more affordable. July inventory conditions improved, and supply is now finally slightly back to the level observed one year ago after 16 consecutive months of declines starting in February 2017. July inventory was 2 percent above last July but still 12 percent below the level recorded in July 2016. 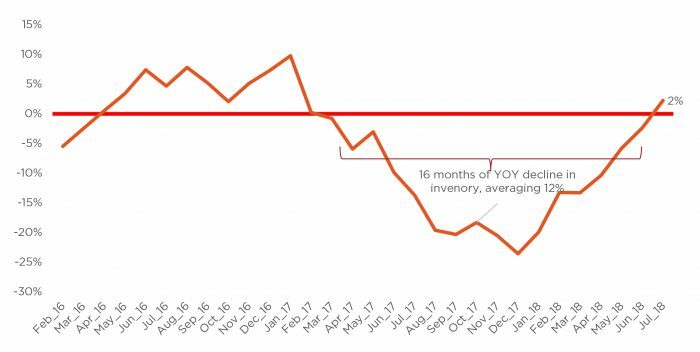 Figure 2 illustrates year-over-year changes in inventory, with the 16 months of inventory trend line falling below the red line, which indicates no change in inventory. Figure 2 also points to an interesting impact of the tax reform, which is less visible in the home sales numbers. The annual decline reached the lowest point in December, as Americans tried to decipher how the tax changes would impact their desire to keep their homes or overall real estate portfolios. In general, researchers across the country have not seen any consistent impacts of the tax reforms on the housing market, though the strong economy, along with job and wage growth, could be masking some of the impacts. It is very likely that as tax season approaches, the true impacts from reduced state and local income taxes, property taxes, and mortgage-interest deductions will become more obvious to individual homeowners. Nevertheless, more homes for sale is an encouraging development following a long trend of fewer and fewer options for buyers. Figure 3 illustrates the trajectory of inventory changes over the last 15 months. Most noticeable is the large annual decline in Santa Clara County in the fall of last year (down by 41 percent year over year in September 2017), which has now seen a relatively higher increase compared with other regions. Santa Clara County’s July inventory was 15 percent above last July. Other regions that saw improvements in inventory include Sonoma County, up by 11 percent, and San Mateo County, up by 4 percent. Marin and Alameda county inventory levels are on par with last year, while Contra Costa County has 5 percent fewer homes for sale. San Francisco, by contrast, continued to see double-digit percent declines in inventory, which have averaged 18 percent since the beginning of this year. However, inventory changes varied notably by price range. Table 2 summarizes changes in total inventory in July compared with July 2017. While overall inventory increased by 2 percent, the most-affordable segment continued to dwindle, except in Sonoma and Napa counties, which both saw more homes priced below $1 million (includes single-family and condominiums) on the market than last year. Sonoma County’s housing market is working through aftermath of last fall’s wildfires, and some homeowners are deciding to sell their Wine Country residences and move elsewhere. On the other hand, Santa Clara County continued to see a buildup in higher-priced inventory, particularly homes priced between $1 million and $2 million, up by 55 percent, or an increase from about 890 homes to about 1,400. Nevertheless, since very strong appreciation has pushed many homes previously priced below $1 million above that price point, combining all the inventory below $2 million shows a relatively smaller increase of 13 percent from last July. A look at absorption rates suggests that Santa Clara County buyers are fatigued, particularly considering 20-plus percent increases in home prices seen since the beginning of the year. Absorption rates measure the ratio of sales to available inventory. Table 3 summarizes changes in absorption rates from last July. Santa Clara County’s absorption rate declined by 13 percentage points, from 52 percent last year to 39 percent today. The largest decline was for homes priced below $2 million, a 16 percentage point decline from 49 percent to 33 percent. Absorption rates for homes priced above $3 million continued to fare better across the entire region except for in Marin County. Marin County is another Bay Area housing market where buyers are exhibiting signs of fatigue. In both counties, volatility in financial markets — particularly for tech stocks — may be affecting buyer confidence. Also, in Santa Clara County, 30 percent price growth since the beginning of the year is pinching younger buyers who may depend on their stock options for down payments or mortgage income qualifications. Furthermore, another measure of buyers’ pulses is the share of homes that sold for more than asking price. While an increasing share of homes have been selling for more than asking price compared with years prior, Table 4 suggests that still more homes sold over the asking price than did last July. Nevertheless, the fatigue indicators discussed above also confirm that fewer buyers were willing to bid over asking price in Sonoma and Marin counties, which posted respective 6 percentage point and 3 percentage point declines. That translates to a drop from 52 percent to 49 percent in Marin County and from 43 percent to 37 percent in Sonoma County. However, as Figure 5 illustrates, Sonoma County buyers of more affordable homes, those priced below $1 million, have become particularly sensitive to bidding wars, with an 8-percentage point drop in the share of homes that sold for premiums. For homes priced between $2 million and $3 million, buyer fatigue set in Santa Clara, Napa, and Marin counties (represented in red and orange). Buyers fatigue in in other regions — especially in Alameda County for homes priced above $3 million — is not setting in. In fact, homes priced above $3 million were much more likely to sell for more than asking price than they did last July, increasing by 11 percentage points, from 34 percent to 45 percent. Lastly, despite buyer reluctance, median home prices continued to trend higher in July. The Bay Area’s median price increased by 12 percent year over year, with Santa Clara County’s 20 percent increase leading the pack. With strong median price growth since the beginning of the year, the Bay Area’s overall median price is up by 15 percent year to date compared with 2017. Table 5 summarizes median prices by county and year-over-year growth. All Bay Area counties continued to post price gains in July, ranging from 6 percent in Napa County to 20 percent in Santa Clara County. Note that compared with previous months, the rate of median price growth has slowed in most areas except in Contra Costa, Marin, and San Mateo counties. While on average price growth has slowed by about 5 percentage points, there are variations across counties. Nevertheless, slowing appreciation was expected and is welcome, as it suggests a better balance between buyers and sellers. Going forward, home price growth is expected to slow further and possibly plateau over the next year. A plateauing of home price growth, however, does not suggest that prices will fall but that the rate at which they are growing will slow. Figure 4 illustrates year-over-year changes in home prices historically in the Bay Area. The rate of median price growth has averaged 6 percent, though there were much larger swings following the housing collapse in 2009 and the subsequent absorption of distressed inventory. However, when looking at numbers since 2013, median price growth averaged 8 percent until the beginning of 2018, when it jumped to 15 percent. Thus, when discussing slowing of price growth, it is from this year’s peak and back to last five-year average. In fact, according to consensus forecasts among housing analysts across the country and Pacific Union’s own outlook from November 2017, home prices nationally are expected to grow by about 7 percent in 2018 and by 6 percent in 2019. In Bay Area markets, price growth is also expected to fall in that range.